Update: I made these again in a normal muffin pan. With two tablespoons of batter in each cup, they’ll need 10 minutes. With three tablespoons of batter, they’ll need 13 minutes. And if you want to make them as normal muffins (filled almost all the way to the top), they’ll need about 15 minutes. Please don’t skip the glaze! The donuts won’t taste nearly as good without it. I only made 2/3 of the glaze today and that was enough. It’s October! I made it all of September without posting a single pumpkin recipe. I think some people are already sick of pumpkin, but I’ve been dying to share these. I had never had pumpkin donuts before I made these, but now I don’t think I want to eat any other type ever again. The best part is that these don’t taste the least bit whole grain or olive oily. Right before I made these, I was thinking that I didn’t like pumpkin so much. I love cakes and things with pumpkin in them, but I was thinking it’s the ginger and other spices that I like. I think I was wrong. Pumpkin is good. That’s white chocolate hot chocolate with pumpkin pie spice right there. Is it normal that I have to dump extra sugar in there? And three times the recommended amount of powder? Maybe I should just drink some melted white chocolate. Having had experienced several baking disasters in the previous days, I only made 5 of these. And now I’m very sad. I want more. 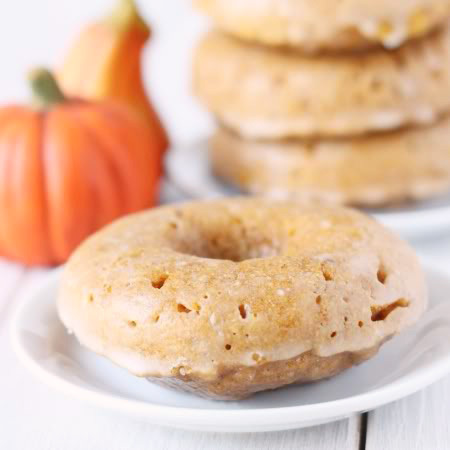 For a gluten-free version, try these Baked Pumpkin Donuts from Allergylicious! In a large bowl, whisk together the olive oil, sugar, egg, vanilla, pumpkin and milk. Add dry ingredients to wet ingredients and mix until just combined. Be careful not to overmix! Grease a donut or mini muffin pan very well. Divide the batter among the molds. Bake 12 – 15 minutes or until a toothpick comes out clean. If making donut holes, bake for 10 – 12 minutes. While the donuts are baking, make the buttermilk glaze by combining all the ingredients in a small bowl. The donuts should be able to fit in the bowl. Eat immediately! They’re okay on the second day, but insanely delicious still warm from the oven. 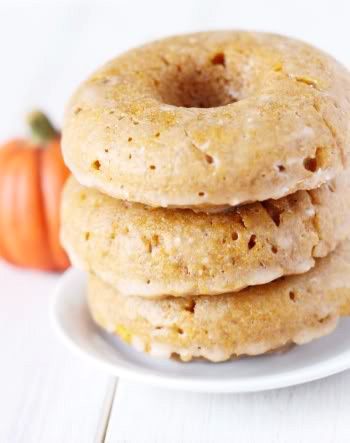 29 comments on “100% Whole Grain Baked Pumpkin Donuts” — Add one! Yum!! 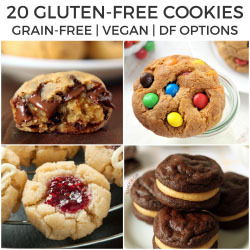 I made these g-f d-f by substituting gluten-free one to one flour and coconut milk and they were fantastic! These are a new family favorite! Yay! I’m happy they came out well. :) What GF baking flour did you use? I tried these with a 1 to 1 baking flour recently and they came out SO dense and heavy. Thanks for your comment! Found your blog from Pinterest, and made these donuts this morning (used fresh ground soft white wheat). They were so unbelievably delicious!!! I couldn’t believe they actually tasted like a donut, and not just a muffin with a whole in the middle!! I made a half recipe, and it made 6 donuts – just right for my Wilton donut pan. I look forward to exploring the rest of your recipes! Does anyone know the nutrional value of these? Oh great! I'm so happy to hear that it turned out the way you wanted it to. I'll update the post with your tip. I noticed that if I let the icing sit for awhile, let the donuts cool completely and then put the glaze on, it turned out just like in your picture! Thanks! Mine turned out fine in a mini muffin pan but the glaze was so thin. In your picture you can actually see the glaze, mine turned out all clear and could not be seen on the donut, it just soaked right in. Any suggestions? What type of pan would you use for donut holes? So psyched to try these, absolutely love pumpkin! i just made these and they are fantastic! great recipe! 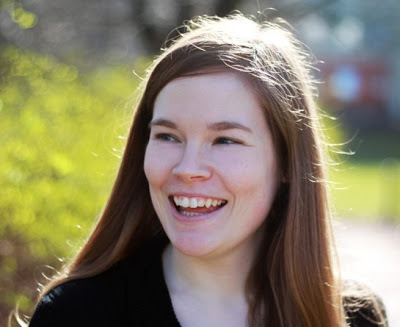 this is my first time visiting your blog and i'm so impressed! i love it! Rose – I just made them again using a normal muffin pan. Some I filled with 2 tablespoons of batter and baked for 10 minutes. With 3 tablespoons of batter, I baked for 13 minutes. And filled all the way to the top, they need about 15 minutes. It's hard to say how many you'll get though because I did a lot of experimenting with different sizes. So you can definitely make them as full size muffins, but they'll still need the glaze because there's not that much sugar in the batter. I hope that helps! Milaxx – Let me know if it works out! It sounds good. 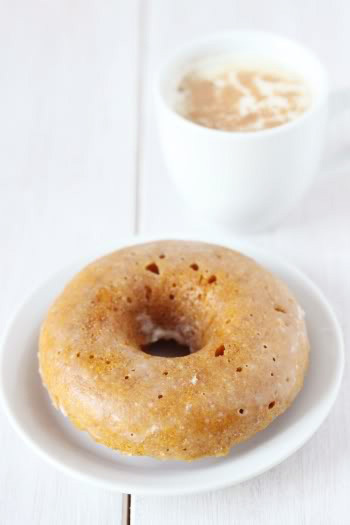 I found you through Glamour.com site as well, and it's serendipitous timing that you offered a tasty yet healthy version of pumpkin doughnuts! I've been itching to make goodies out of the three cans of mashed pumpkin I just purchased today. Thank you Erin, and Happy Eating! I recently discovered Bob's red mill all purpose baking flour. I think I'll try my own gluten free version using that & almond milk. I'm also thinking I'd prefer topping them with candied pumpkin seeds. Just found you via Glamour.com. These look SO good. I think I'll try them! I love whole spelt! Things normally don't come out as heavy and healthy tasting as with whole wheat. But these doughnuts turned out wonderfully with whole wheat, so either way, they should be great. Let me know how they turn out! I hope you enjoy them. These look delicious. I FINALLY bought a donut pan the other day and I think I might need to make these as soon as possible. Love that you used whole grains! I would love to try them with spelt. Oooh, peanut butter cheesecake! I hope you share your recipe. Thank you! :) If you do get a doughnut pan, get the normal sized one and not the mini one. Mini doughnuts are cute but they're are a pain to fill. And if you're like me and think that because they're small you can eat more, you'll end up eating half the pan.